Risk assessment is primarily a business concept and it is all about money. You have to first think about how your organization makes money, how employees and assets affect the profitability of the business, and what risks could result in large monetary losses for the company. After that, you should think about how you could enhance your IT infrastructure to reduce the risks that could lead to the largest financial losses to organization. Nevertheless, remember that anything times zero is zero — if, for example, if the threat factor is high and the vulnerability level is high but the asset importance is zero (in other words, it is worth no money to you), your risk of losing money will be zero. Identify vulnerabilities and assess the likelihood of their exploitation. A vulnerability is a weakness that allows some threat to breach your security and cause harm to an asset. Think about what protects your systems from a given threat — if the threat actually occurs, what are the chances that it will actually damage your assets? Vulnerabilities can be physical (such as old equipment), problems with software design or configuration (such as excessive access permissions or unpatched workstations), or human factors (such as untrained or careless staff members). Assess risk. Risk is the potential that a given threat will exploit the vulnerabilities of the environment and cause harm to one or more assets, leading to monetary loss. Assess the risk according to the logical formula stated above and assign it a value of high, moderate or low. Then develop a solution for every high and moderate risk, along with an estimate of its cost. Create a strategy for IT infrastructure enhancements to mitigate the most important vulnerabilities and get management sign-off. Congratulations! You’ve finished your first risk assessment. But remember that risk assessment is not a one-time event. 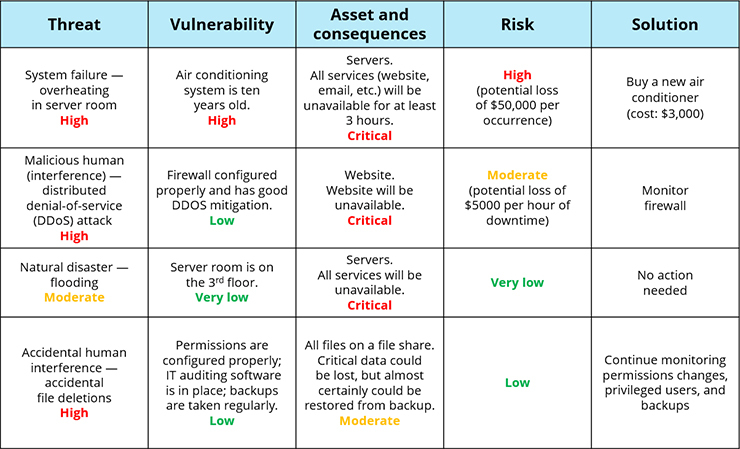 Both your IT environment and the threat landscape are constantly changing, so you need to perform risk assessment on a regular basis. Create a risk assessment policy that codifies your risk assessment methodology and specifies how often the risk assessment process must be repeated. 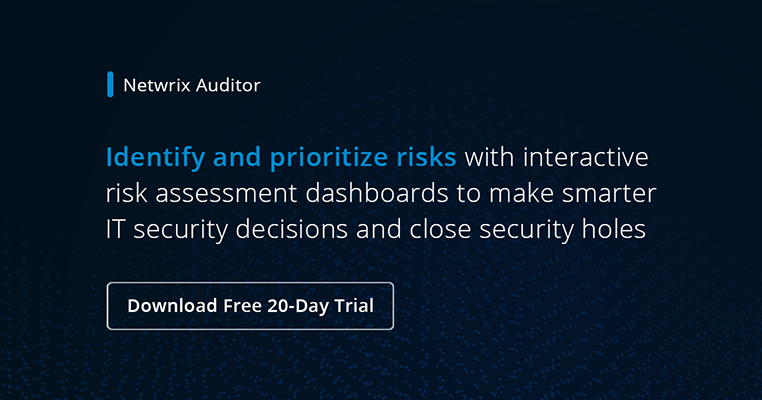 Watch our recorded webinar on IT risk assessment to learn how Netwrix Auditor can help you identify and prioritize your IT risks, and know what steps to take to remediate them.